In mid-1960’s, a Canadian businessman named Bob Gavin asked his patent attorney Bob Beech of Seattle, “What’s new?” Mr. Beech lifted his long, hairy eyebrows, gave Mr. Gavin the look and proceeded to tell him about another client, Jim Cox, who was having a hard time paying his legal fees on a number of outstanding patents, all pertaining to nutrition science and/or pollution control. The result of this inquiry led to Mr. Gavin generously paying off Jim’s legal fees and asking Jim to come work for him in Vancouver, B.C. with one of U.K.’s largest rice importers. 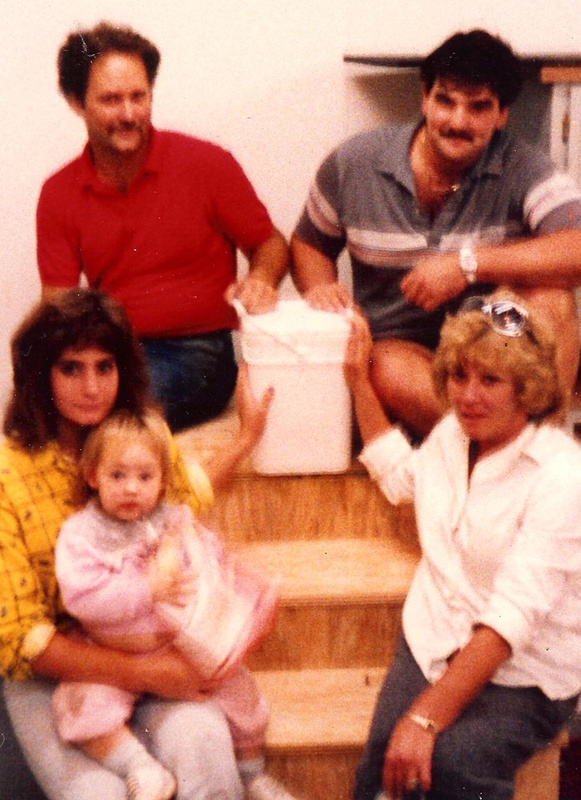 This worked out nice for Jim and Jeanne as they were already into rice, not only feeding their growing family with it, but understanding the enormous applications and opportunities rice presented in the global market. Back then, rice was the second largest abundant cereal crop in the world, trailing slightly behind wheat. Half of the world’s population depended on rice for 80% of their food. Some 30-40% of the rice produced globally consisted of broken grains which were discarded or milled into flour, resulting in staggering loss in cash value and direct loss for the food chain. 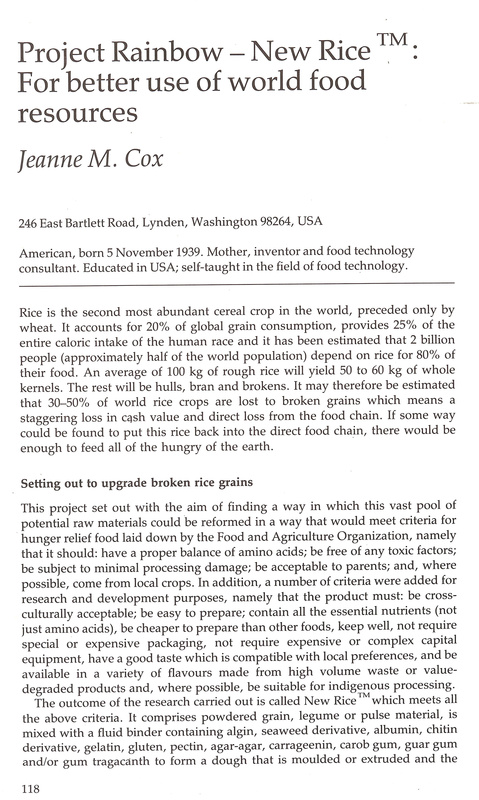 Jim and Jeanne’s idea was to utilitize the wasted broken rice grains and produce a nutrition-enhanced instant rice product to fight world hunger. The first criteria for feeding the people was to create a nutritious food that could be identified by the indigenous people. Second, the food should be easy to prepare, even in the crudest method on a dung burner, in less than five minutes, all the while maintaining it’s integrity as a recognized food. The rice should be fortified with protien, which was easy, and also vitamins A and D, which were not so easy to formulate to stand up to high tempertures during the cooking process. The importance of vitamin A is crucial in nutritional feeding as the lack of it can lead to blindness. Jim discovered sodium alginate and calcium chloride, together with vitamin E encapsulated the starch in the broken rice grain, so when it came off the heat, it would still be intact. Sounds simple, but for this family-based food invention, it took years to figure out. 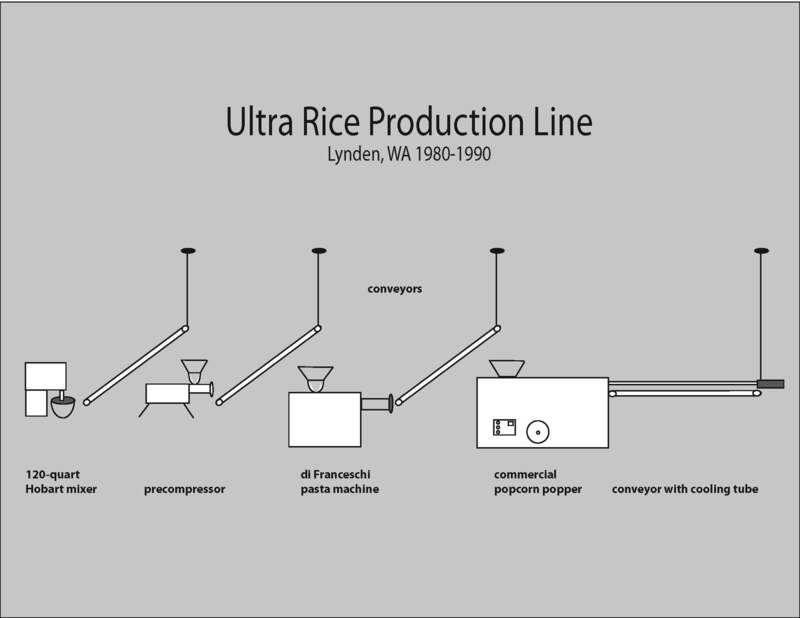 With the foundation for Ultra Rice’s formula developed, Jim invested in a La Parmigiana commercial pasta machine with an orzo-shaped dye, which under the right pressure, simulated a whole grain of rice. A large grinder was purchased used from a bread company to make rice flour. 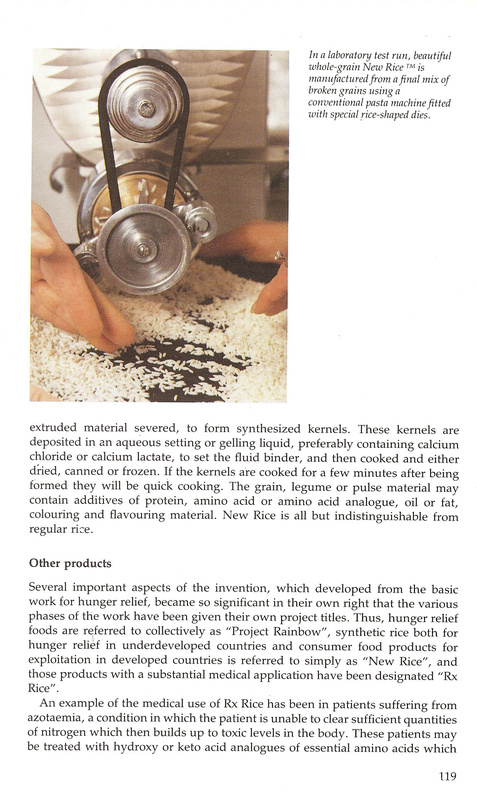 Samples of Ultra Rice were easier to make, but the batches produced only a few pounds of finished product. In time, it became necessary to scale up and produce Ultra Rice on a commercial level so it could be tested in the marketplace. “In 1978, when I turned eighteen, I cut my long hair, started carrying a briefcase and went to work for my father. My new job was to build a mini-scale commercial production facility for Ultra Rice out of the plant we had been using to make fish bait. Dad insisted we never throw money at problems, so we built much of our own equipment from used parts that we already had. Everything we did was based on Ultra Rice’s formula, which was continuously being altered to fit the new production facility. I’d wake up to new handwritten instructions Dad wrote out the night before having discerned that day’s work. 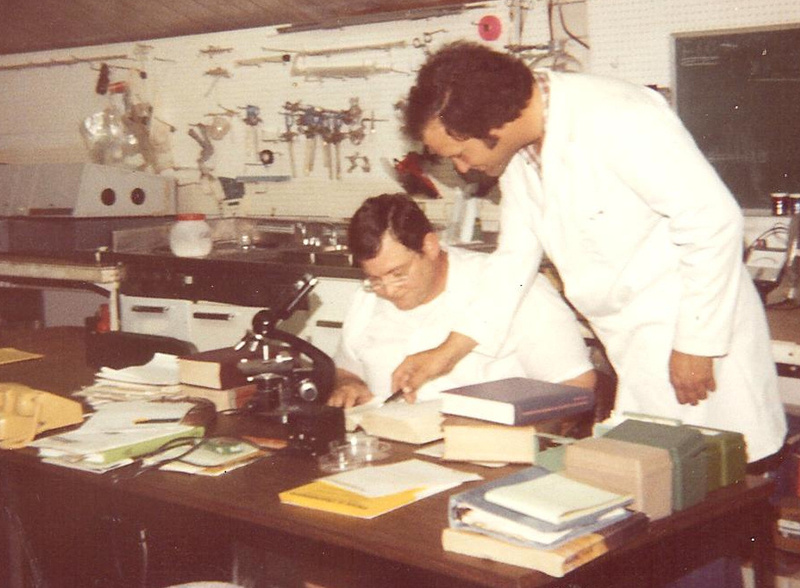 We ran hundreds of formulations with many failures those first few years – big messes to clean up, thousands of pounds of rice thrown away. Ultra Rice was a husband and wife team. They were teenagers when they met in the mid 1950s. Wearing his air-traffic controller’s uniform, he approached her on the beach outside her parents home on Lake Lotawana, Missouri. She took him watersking that day, which he had never done before, and as hard as she tried, she could not shake him from the line off the Century ski boat, or her heart. Time on the water proved to be the foundation of Jim and Jeanne’s relationship. Throughout their lives they would continue to come back to the water for time together, for new beginnings. Both born late in the Depression and witness to the end of WWII at an early age, together they grasped the idea they could do anything, even change the world. Raised alone by his mother Gilly, a Kansas City business woman, real estate owner and night club singer, Jim spent most days and nights by himself reading, imagining and inventing solutions to the world’s problems. He learned to cook for himself dispite the limited offering of canned food in the cupboard, and to sew and mend his own clothes. Continuing the male tradition in her family, Gilly sent Jim to Wentworth Military Academy to learn how to be a man. 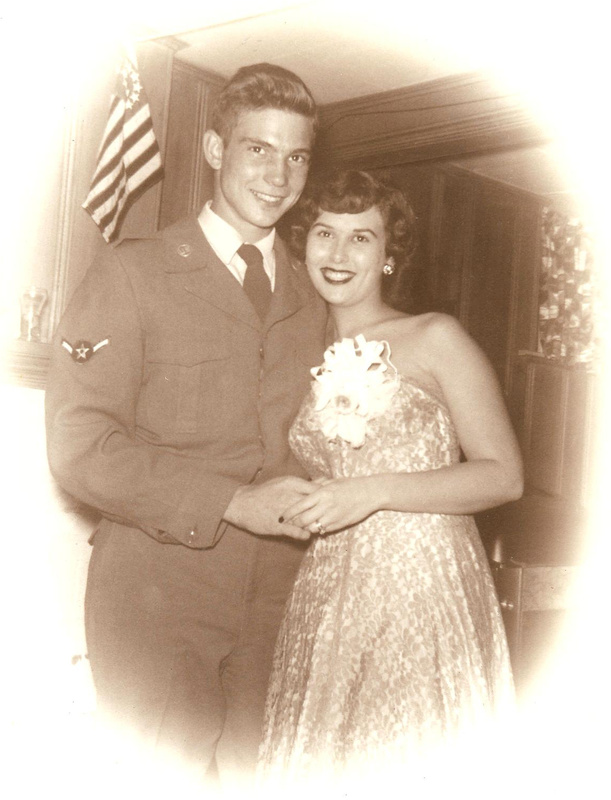 Jim and Jeanne quickly married and moved around getting acquainted with the real world. Cooking became an issue again as Jeanne could not boil water and thought hamburger was ground ham. A daughter soon came and then a son. Jim was having a hard time finding his nitch and keeping a job. In time, Jim’s mother and step-father intervened to raise the two young children as their own. For Jim and Jeanne, the pain of this loss never left them. After winning at the races, Jim bought a small shrimp boat and took his turn at fishing off the Louisiana Gulf Coast. Inexperienced and indifferent to the other fisherman, Jim went his own way and with Jeanne onboard, eventually ran aground when the tide went out. With time on their hands, waiting for the water to rise, they must have thought about the future. 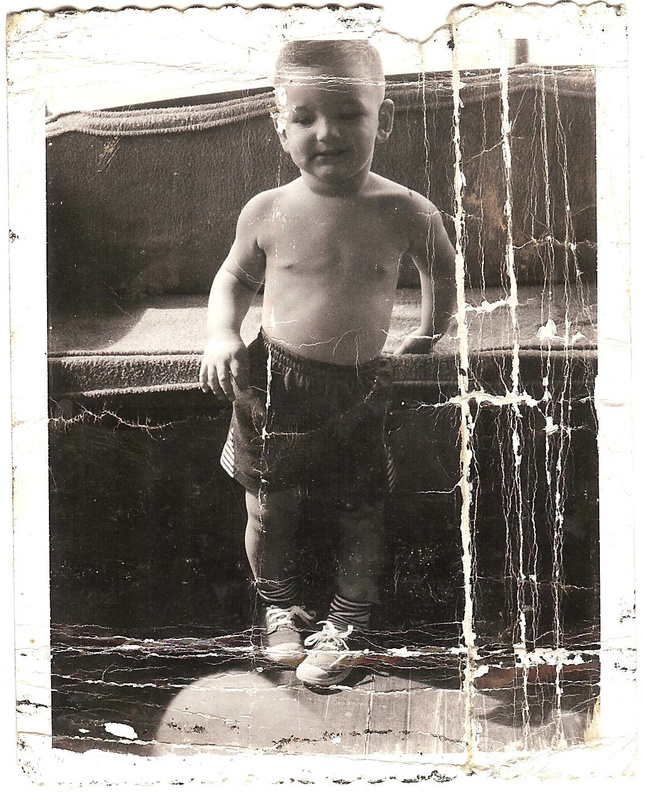 Nine months later, on April 10, 1960, another son was born. Kelly Keven Cox. 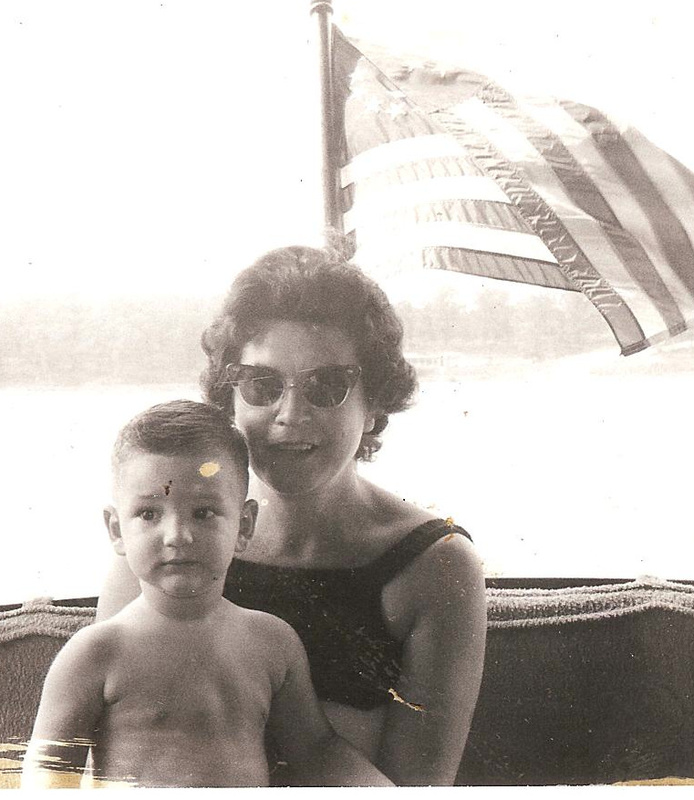 Kelly with Jeanne’s mother, Helma Hartman, in the Century ski boat on Lake Lotawana, Summer 1961. With a new baby and a fresh start, Jim moved his family to Portland, Oregon and took a job delivering bread. One day while touring a vegetable processing plant, he noticed a number of women with missing fingers and lacerated breasts. They were processors on the brussell sprout destemming line and had suffered injuries from uncovered spinning blades. Solution in motion, Jim went home and built a brussell sprout destemming machine from a drill motor and plywood. He convinced the plant manager to come to the house and see the machine. A local machine shop was commissioned to reproduce the machine, a patent was filed, and Jim received $1500 a month royalty. 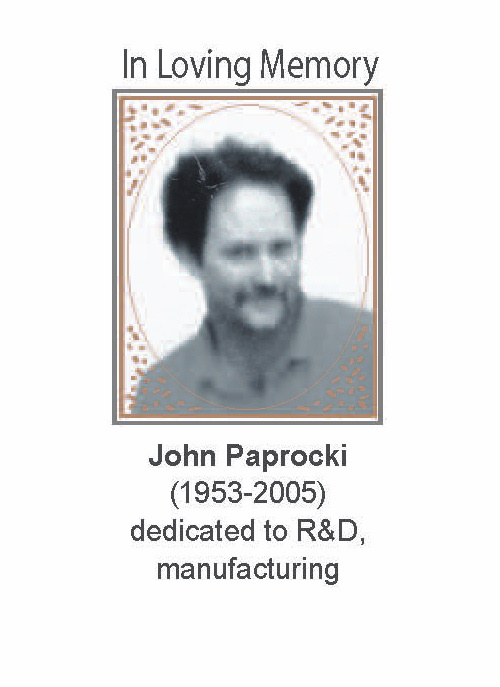 Now he could support his family and continue his work as an inventor. 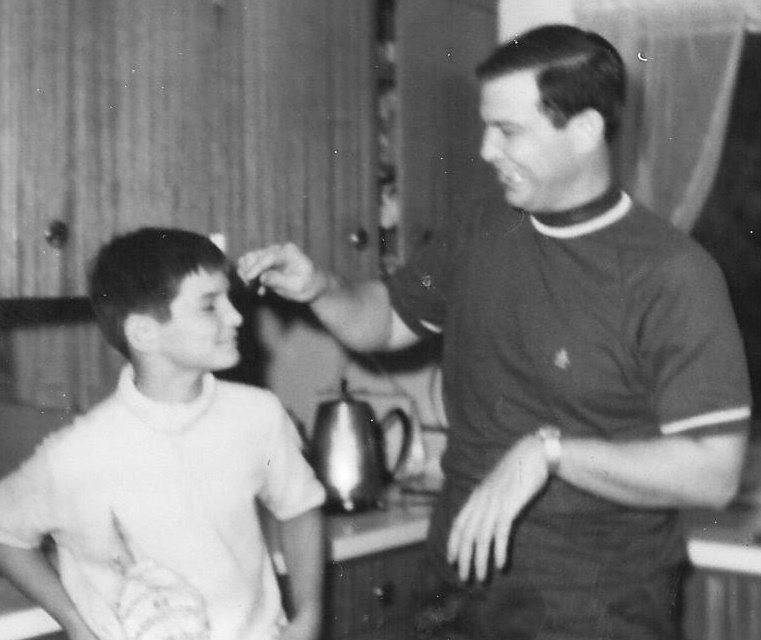 Jim measuring his son Kelly’s height while living in Canada, 1968. What started out as “Project Rainbow” became known as Ultra Rice, a grain product made to resemble rice and fortified with vitamins and nutrients. Each year, Rolex recognizes the importance of highlighting the “spirit of enterprise” in a world which tends to encourage conformity and mediocrity, and in which individual efforts are often overshadowed by bureaucracy and the industrial machine. 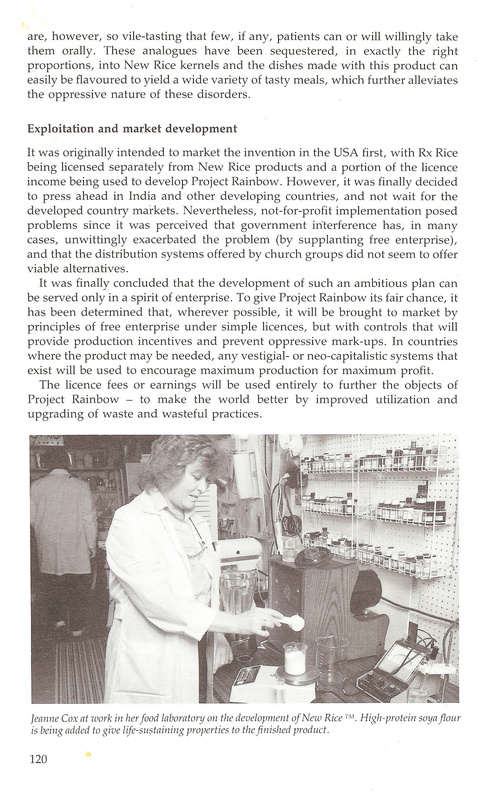 “Project Rainbow – New Rice” was amongst the 1987 Rolex Spirit of Enterprise Awardees.